I am but an amateur in the field of Daylilies. But I know what I like. My perfect daylily must be medium to large plant (I have a big property), must be brightly coloured (no washed out colours for me) and must bloom for a long time. But I can make exceptions. Daylilies are a diverse group on colour and form from many years of hybridization by both amateur and professional daylily breeders. I don't know who has the most varieties, Hosta or Daylilies. They emerge early in the spring with wonderful grassy leaves coming up at a time to cover the dying foliage of spring bulbs. They are clump forming, are not aggressive spreaders and are easily divided. Very low maintenance and work well in a perennial garden or with shrubs. The colours are amazing. What more could you ask for. Late July and Early August can be down times for colour in the garden, and this can be due to the fact that most people have finished buying and planting new perennials. And the general public tend to purchase plants in bloom, there for they miss out on great plants for later in the season. Serious gardeners know better. Daylilies are just one type of plant that can fill this gap. Some bloom earlier in the season and some later but the bulk of them bloom during this time. The Daylily is so named because the flower usually does not last more than 24 hours. This does not make them useful in flower arranging but they do make good cut flowers because unopened buds continue to mature and open over many days. They come in a range of colours from yellow to orange, all shades of pink and red, lavenders, green tones and almost black and almost white (but not quite). Blues still elude the breeders although the name 'Blue' pops up in some varieties. 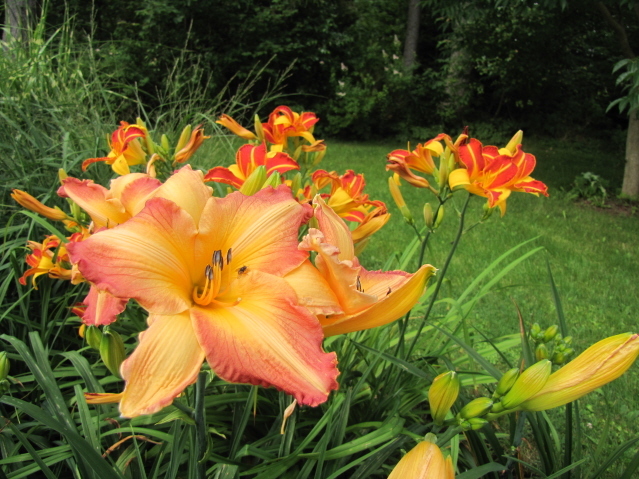 Daylilies do cross pollinate easily, and I am not going to get into terms like diploids. tetraploids etc..... I would have to look them up and try to interpret them (did not do well in genetics in school) and I will leave that to the professionals.﻿ They are constantly breeding for ruffles, doubles, colour, fragrance and reblooming or continuous blooming such as the Stella series. Name your combination, it is probably out there. I have played around with seed, purchasing some seed years ago from Garden's North. I had a range germinate that were from lavender (see above) to reds, yellows and others. This lavender is really nice. I have not sold any yet, maybe next year, and I will need to find a name for it. 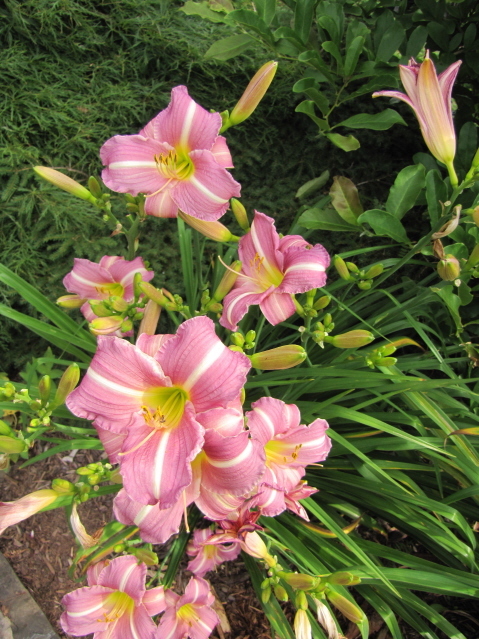 A daylily breeder would probably cull it out since the newer ones are more frilly or more exotic. They have exotic prices too.